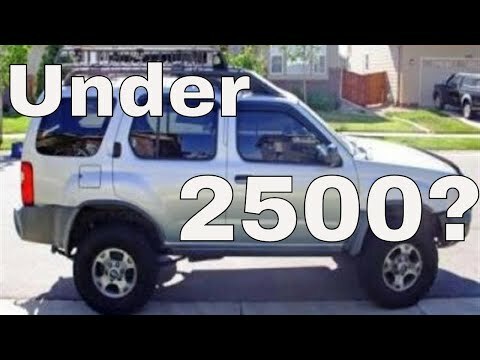 2000 Nissan Xterra, best SUV ever! I drive a 2000 Nissan Xterra. It is a v6 and it is 4 wheel drive. My Xterra has almost 260000 miles on it and I have only had two issues with it since I purchased it. I have replaced both o2 sensors. The only upgrades I had to do was to put in an aftermarket radio and add a towing package to it. I love this SUV. Seats are comfortable and well made. I do not regret buying this SUV. Comfort and reliable, fun to drive. It performs very well. The best part of it is performance is in the winter. It performs well in the mountains. I bought it brand new and it has lasted 18 years, it is very reliable. It has stadium seating in the back, so whoever sits in the back can see out. It has a roomy cargo area and the seats lay down for extra cargo. My dogs love the ride, too. Compact low end SUV. No frills, when it works, it does alright. Certain light duty trucks and sport utility vehicles equipped with automatic transmissions fail to comply with the requirements of Federal Motor Vehicle Safety Standard No. 102, "Transmission Shift Lever Sequence, Starter Interlock, and Transmission Braking Effect." These vehicles could have a shift cable lock plate that is too brittle and can break. The gear shift lever and the "PRNDL" indicator may move, but the transmission will not shift out of the "Park" position. Also, the gear indicated on the display may differ from the gear engaged in the transmission. If the driver selects "Drive" and the transmission is actually in "Reverse", a vehicle crash could occur. Dealers will replace the automatic transmission shift cable lock plate. The manufacturer has reported that owner notification began Nov. 6, 2000. Owners who do not receive the free remedy within a reasonable time should contact Nissan at 1-800-647-7261.